Ok, we did what I liked about the iPad. Here's what I don't like about the iPad or parts for it that I feel is dumb. Compared to the laptop, it is much lighter. However, as a device that you are considering to carry around with you all day, this is actually very heavy and even more so as the day dragged on. I was attending an event last Sunday and I carry this with me and by the end of the day, my arm was about to drop off. For those who still remember the TV series Las Vegas, the character restaurant hostess, Delinda, is often spotted carrying a tablet to manage her tables. That alone for those, who know their tech, is purely fiction both in the weight as well as battery juice department. Now that iPad is lighter and packs more juice, it is sadly still fictionally feasible. With iOS4 comes multi-tasking and with multi-tasking comes memory leak. In case any one hadn't noticed, iPhone/iPad apps does not come with an OFF button i.e. you can't shut down an application. pre-iOS4 models is fine with it as single-tasking means closing of the app whenever you hit the home button. However, now that you have multi-tasking, hitting the home button only brings it to the background and still running and hogging a chunk of resources. As you open more and more applications, the dwindling memory will eventually jam up the entire machine forcing you to either task kill the apps individually or do a reboot to start afresh. I have the 3G model where I took the sim card, from my China Unicom WCDMA USB Mobile Broadband Stick, and inserted it into the iPad. Sad to say, the 3G speed on the iPad is significantly more sluggish than the originally USB stick. One thing I hate about Apple is telling you what you can do, and what you can't. Over here, it tells you that you can't download Apps from other places except their store. Android Market is just as guilty but at the very least it doesn't totally prevent you from visiting alternative apk sites. 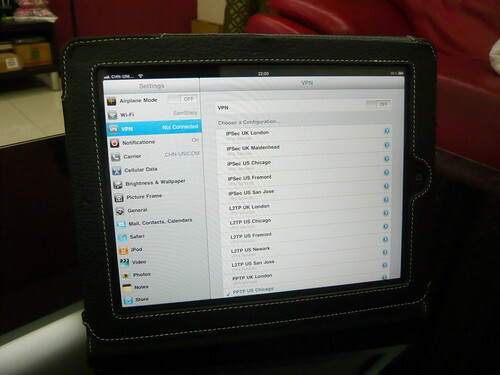 Still on the what-you-can-do,-what-you-can't-do department, the iPad does not allow you to connect to peripherals. You can't plug in a USB drive to gain access to external storage nor plug-in a USB mouse. Everything is proprietary which will cost you your liver and a kidney. If there is one word to describe the touchscreen keyboard, it's retarded. The response is unable to keep up with my typing. Then again, could it be due to the fact than sensitivity is somewhat impeded by the presence of the screen protector layer? Also, keyboard should be 5 rows not 4, dammit!! Granted I understand that on the iPhone, 4 rows is deployed as a result of real estate constrains but now that we have iPad big screen, we need the buttons to be so big for what? I'd rather put in the numeric top row like a good Qwerty keyboard should be. Barffie, showed me a way to turn off the programs in the background, you double click on teh button and can go and turn off programs you are not using. not sure if that will solve your memory leak problems though. NaiveGuy: Yes, double click then press and hold the app. A No-Entry sign will appear on the top left corner which you press to kill. It does resolve the memory leak problem but you gotta agree that it is a dumb fundamental problem to have in the first place.